در این سری مقاله سعی من بر این است تا ابزارهای مونیتورینگ که در این قسمت (۱) بیشتر کنسولی هستند را معرفی کنم و همچنین سیستم عامل رو من debian در نظر گرفتم که شما میتونید با نیازهای خودتون تغییراتی بدین.ابزارهای این شماره بنظر ساده میان ولی بسیار کاربردی هستند,در ضمن من ابزارهای متفاوتی معرفی میکنم که شما باید بهترین اونو انتخاب کنید. 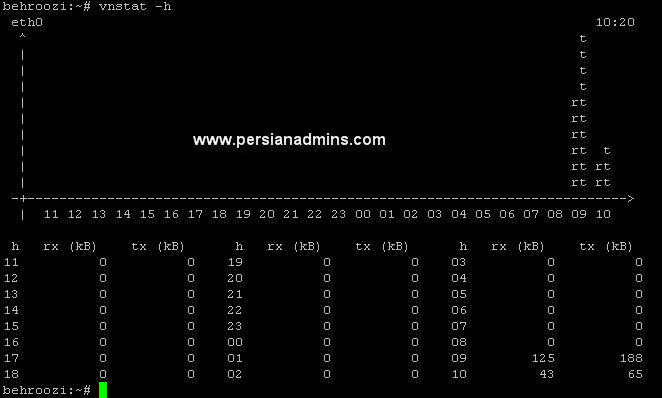 در این شماره تمرکزمون رو روی مونیتورینگ cpu , ram , swap , mount points , network interfaces از طریق کنسول و یصورت لوکال نه ریموت یعنی منابع از روی کامیپوتر دیگه گرفته نمیشه هر چند که شما میتونید از طریق putty نتایج رو از هر جای دیگه هم ببینید. در شماره های آینده به معرفی و نصب برنامه های پیشرفته تری میپردازیم. بعضی از لغات اگرترجمه بشن معنی خودشون رو از دست میدن پس من از این کار خودداری میکنم,همچنین از مشخصه های یک مدیر شبکه آشنایی با زبان انگلیسی در حد لازم برای برطرف کردن نیازهاش میباشد. امروزه نظارت برسیستم و منابع سیستم یکی از اساسی ترین نیازهای هر شبکه و مدیر شبکه ای برای بررسی میزان کارایی اون شبکه و سیستم میباشد.اگر منابع سیستم کم باشد یا به مرور مشکلاتی برای سیستم به وجود آمده باشد عدم آگاهی از این رخددادها عواقب وخیمی درآینده در پی خواهد داشت. منابع سیستم هم بوسیله کاربر می تواند مصرف شود هم بواسطه سرویس هایی که بر روی سرور قرار دارنداز قبیل وب یا میل .توانایی در جهت شناخت اتفاقاتی که در معرض روی دادن است می تواند به تشخیص اینکه سیستم احتیاج به بروزرسانی دارد یا نه کمک شایانی کند یا حتی اگر سیستم نیاز دارد تا یک سرویس به سرور دیگری منتقل شود. 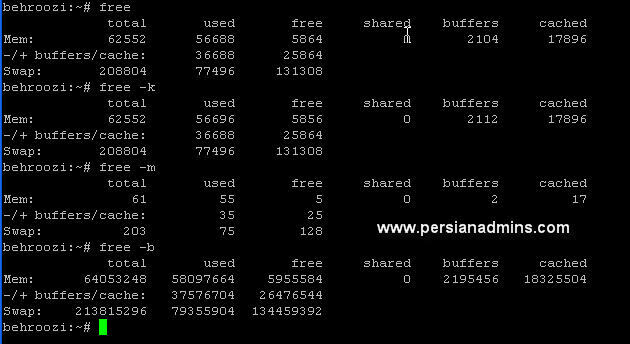 free is a UNIX command which displays the total amount of free and used physical and swap memory in the system, as well as the shared memory and buffers used by the kernel. top provides an ongoing look at processor activity in real time. It displays a listing of the most CPU-intensive tasks on the system, and can provide an interactive interface for manipulating processes. It can sort the tasks by CPU usage, memory usage and runtime. can be better configured than the standard top from the procps suite. Most features can either be selected by an interactive command or by specifying the feature in the personal or system-wide configuration file. See below for more information. htop is a very competent interactive process viewer for the shell, providing all the functionality - and more - that the top utility does, in an easier and more intuitive way. 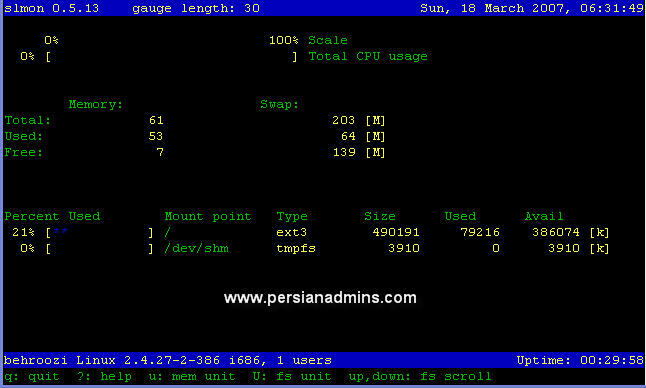 htop provides easy-to-use menus for most operations and also has support for using a mouse. ‘htop’ starts faster (’top’ seems to collect data for a while before displaying anything). 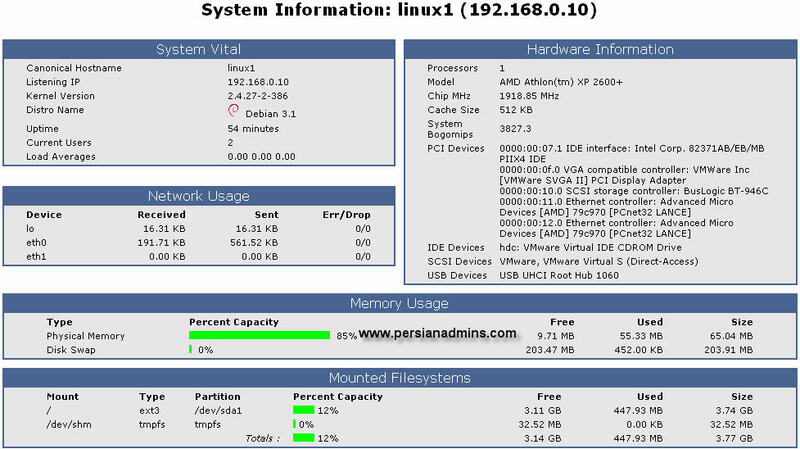 SLmon is a tool for monitoring a system's performance. It displays results using a nice and easilyreadable text-based UI. It has the ability to monitor CPU load (SMP is supported), memory/filesystems usage, network interfaces, uptime, date and time, and the number of logged in users. The sar command collects and reports system activity information. The statistics reported by sar concern I/O transfer rates, paging activity, process-related activities, interrupts, network activity, memory and swap space utilization, CPU utilization, kernel activities and TTY statistics, among others. Both UP and SMP machines are fully supported. 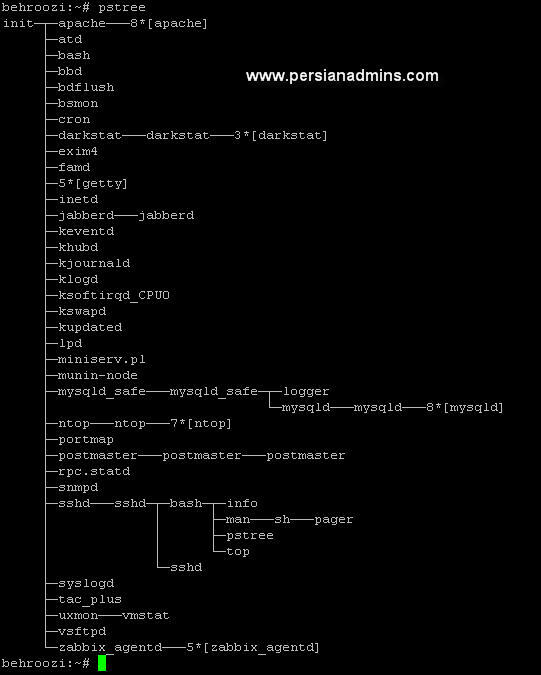 For ۲.۴ kernels the devices is names using the device's major and minor number. In this case the device listed is SCSI. To have iostat print this out for you, use the   -x. The jmon tool monitors selected resources (memory, cpu, I/O) used by a running batch job on a particular machine, as well as overall machine activities. stat allows you to view all of your system  resources  instantly,  you can eg. compare disk usage in combination with interrupts from your IDE controller, or compare the network bandwidth numbers directly with  the disk throughput (in the same interval). vnStat is a console-base network traffic monitor that keeps a log of daily and monthly network traffic for the selected interface(s). However, it isn't a packet sniffer. The traffic information is analyzed from the proc(۵) -filesystem, so that vnStat can be used without root permissions. This is a very tiny bandwidth monitor (not X۱۱). Can monitor up to ۱۶ interfaces in the in the same time, and shows totals too. 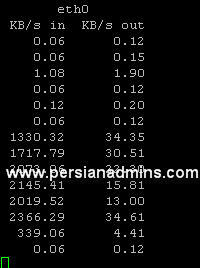 ethstats خروجی کارت شبکه ها رو براساس مگابیت بر ثانیه و پکت بر ثانیه نشان میده..البته همچین با حال نیست!! 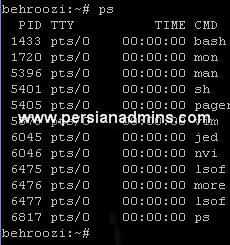 ifstat is a tool to report network interfaces bandwith just like vmstat/iostat do for other system counters. 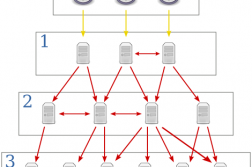 It can monitor local interfaces by polling the kernel counters, or remote hosts interfaces using SNMP. iftop does for network usage what top(۱) does for CPU usage. It listens to network traffic on a named interface and displays a table of current bandwidth usage by pairs of hosts. Handy for answering the question "why is our ADSL link so slow?". IOG is a network I/O byte grapher made to graph cumulative KB/MB/GB totals for hours/days and months. It is intended to be simple, fast (support thousands of hosts) and integrate well with MRTG. Data for each host is updated hourly and HTML graphs are created. It uses a data consolidation algorithm which allows for a small, non-growing database file for each host. No external graphing libs or executables are required. df به شما میگه که چه مقدار فضای آزاد و اشغال شده در هر کدام از mount های خودتون دارید از قبیل هارددیسک , فلش , …. The df command is used to show the amount of disk space that is free on file systems. This option instructs df to display information about inodes rather that file blocks. Even though you think of directory entries as pointers to files, they are just a convenience for humans. 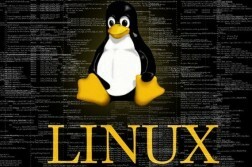 An inode is what the Linux file system uses to identify each file. When a file system is created (using the mkfs command), the file system is created with a fixed number of inodes. If all these inodes become used, a file system cannot store any more files even though there may be free disk space. The df -i command can be used to check for such a problem. پس اگر دیدید فضای خالی دارید ولی نمیتونید چیزی رو اضافه کنید حتما از این دستور استفاده کنید,شاید یه لبخند رو لبتون اومد و باعث شادی روح اینجانب شد. discus هم مثل df برای دیدن مقدار فضای آزاد یا اشغال شده mountها کاربرد داره که فکر کنم امکاناتش از df کمتر و فقط یه گراف اضافه کرده ,همچین باید نصبش کرد. Tells you how much space a file occupies.